Massage and touch can be a powerful and effective tool for helping women during childbirth. The use of massage is not a new concept. The earliest record of massage therapy dates back to 2400 BCE in the Tomb of Akmanthor . It has been indicated that massage was also used in ancient India, China, and Japan (Modern Ghana, 2014). Modern and scientific evidence supports the use of massage during labor. A 2016 study on the effect massage therapy on the duration of labor found that those who received massage therapy during the first and second stages of labor had a significant decrease in labor duration as compared to the control group. There was also evidence of improved Apgar scores in newborns in the first minute and fifth minutes (Bolbol-Haghighi, et al. 2016). Massage during labor is an effective pain control method. In 2012, an article published in the Archives of Gynecology and Obstetrics, concluded that a 30-minute massage during labor conducted in three phases resulted in self-reported reduced pain, decreased anxiety and increased satisfaction during labor. As part of their toolkit, a doula should have a repertoire of massage techniques that they can use while they assist laboring people. 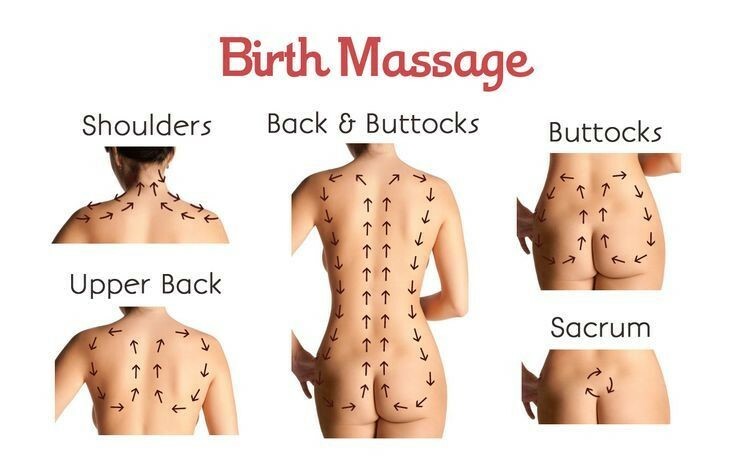 The graphic below provides some helpful imagery for massage technique during labor. The pressure of the massage depends on the comfort level of the laboring person. Consider the use of tools to help with massage, so as not to tire yourself out while you are assisting. The use of tennis balls on the lower back or hips or using a rolling pin (hollow) filled with ice can provide pain relief. Massaging in between contractions, using long strokes down the mid back to the sacrum, stroking up the back and massaging the shoulders and neck, applying counter-pressure during contractions at sites of pain, and hip squeezes to help with relief of back pain are helpful Massage Techniques for Early Labor (Stillerman, 2007). Effleurage is a massage technique that involves a light pressure over the body. During labor, a doula can use a flat hand to stroke the client’s back, arms, and legs. Feathering, a sub-category of Effleurage is performed solely with your fingertips. A laboring person might find this helpful during contractions over their abdomen (Birthing Naturally, n.d.). Youtube is a great resource for short tutorials on massage techniques for labor, such as this video published by the Hypnobirthing Midwifelabor: https://binged.it/2JyBPnW. Of course, include reading materials like The Healing Touch of Massage, a book by Carlo De Paoli and hands-on workshops. Lastly, don’t forget that massaging your clients isn’t just for labor! Offer a prenatal and postpartum massage to help increase relaxation, reduce back pain, and improve sleep. Be sure to always ask about pressure preferences and make sure the pregnant person drinks at least 16 ounces of water after a massage. The use of massage is a fantastic tool for a doula to use in assisting before, during, and after labor.